Top 5 Amazing Things To Do While Enjoying Your Dooars Tour! Do you wish to have a substantial and delightful getaway from the cacophony of your daily life? Are you on the lookout for an ideal destination where you can enjoy the beauty of the hills along with numerous other splendid attractions? No worries! Opting for a trip to the Dooars can undoubtedly be your best place for a memorable and incredible trip! Known as the getaway to the hill stations of Bhutan and North Bengal, Dooars are the floodplains in the North-east India which lie north of the Brahmaputra river basin and south of the Himalayan foothills. Be it the lush green forests, famous wildlife sanctuaries or the beautiful tea gardens, Dooars has something to offer to every nature lover and adventure seeker. Thus, be it a trip with your friends or with family, Dooars can be an ideal getaway, no matter what the occasion is! Wondering how to make the best of your trip? Read on then to check out what you can do during your trip! Lava is a forest village which welcomes each of its visitors with fir and oak trees. The place boasts of a popular Buddhist monastery known as the Lava Monastery. It is every bird watcher’s delight. Lolaygaon is higher up than Lava. Tourists can enjoy a stunning view of the sunrise from Jhandi Dara (wooden hilltop). The age-old forest of towering pines, oaks and cypress with their mossy trunk is every nature lover’s ideal destination for watching endangered Himalayan species. Situated on the banks of the beautiful river Murti, Gorumara is widely known for the King Cobra and the great Indian one-horned rhinoceros. Some of the other popular animals include- bisons, elephants, reptiles and leopards. Gorumara even boasts of a rich flora which includes trees like Simul, Khair, Teak, Siris and Sal. 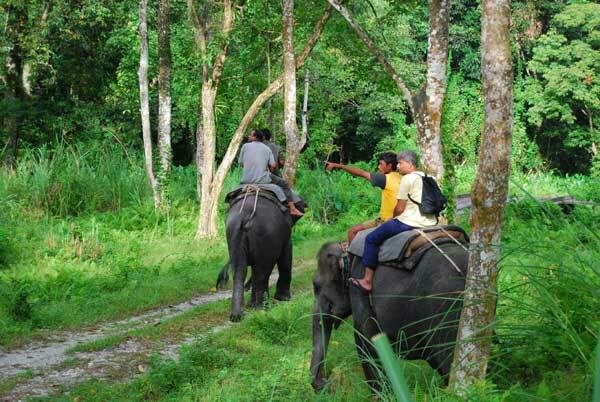 A visit to the Gorumara can thus be ideal for every nature lover during the upcoming holidays. Located in the foothills of Eastern Himalayas, the Jaldapara Wildlife Sanctuary is one of the most popular attractions of the Dooars tour package. It boasts of the largest concentration of the endangered one-horned rhinoceros after Kaziranga National Park. Another chief attraction of the forest is the Royal Bengal Tiger. The forest is a mosaic of grasslands, woods, sandy river banks, perennial streams and vast belts of tall grass. Opt for a jeep safari in the forest to catch glimpses of the great diversity. Situated in a woody forest area, the Neora Valley National Park is home to an abundant species of orchids which crowd the park. Tourists can spot wild animals like Himalayan black bear, red panda, wild dog, etc. If you are an adventure seeker, you can trek to Rechela Danda, the highest peak in the forest. The park even forms to be a popular picnic spot. Buxa Tiger Reserve is a sanctuary situated in the Alipurduar Sub-division of Jaldapara district. It is popularly regarded as the crown gem of Doars. Due to a range of natural parameters like climate, topography, rainfall and temperature, the sanctuary boasts of rich flora and fauna. So what are you still waiting for? Find a great tour operator and opt for the ideal tour package. Time to worship wilderness!